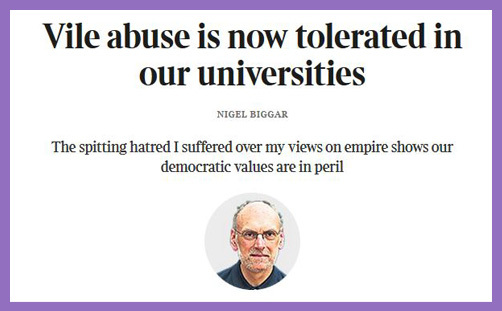 Professor Nigel Biggar has written for the Times: ‘Vile abuse is now tolerated in our universities‘. He tells us: “The spitting hatred I suffered over my views on empire shows our democratic values are in peril.” And he recounts a few flecks of that spitting hatred, and how he tried to address his appalling treatment morally and ethically, as you might expect a Regius Professor of Moral & Pastoral Theology, and Director of the McDonald Centre for Theology, Ethics, & Public Life at the University of Oxford, to do. If on the other hand we recognise that the history of the British Empire was morally mixed, just like that of any nation state, then pride can temper shame. Pride at the Royal Navy’s century-long suppression of the Atlantic slave trade, for example, will not be entirely obscured by shame at the slaughter of innocents at Amritsar in 1919. And while we might well be moved to think with care about how to intervene abroad successfully, we won’t simply abandon the world to its own devices. 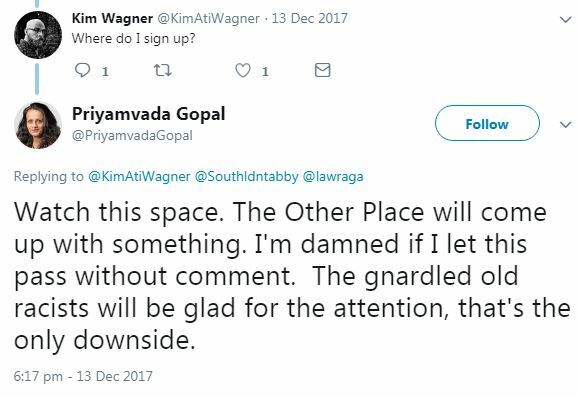 ‘The Other Place’ refers, of course, to Oxford, which Dr Gopal (a somewhat sectarian Cantabrian) avers is packed with “gnarled old racists” yearning for attention (or is that just Christ Church? It isn’t clear..). He’s lucky: at least he wasn’t called an ‘Islamophobe’, ‘misogynist’ or ‘homophobe’, for then the Dean would have had to step in. The new trinity of civil religion – Equality, Tolerance and Respect – admits no moral or ethical inquiry which might challenge or be perceived to challenge its infallible precepts, of which Dr Gopal is one of the self-appointed guardians. The proposal to examine the virtues of colonial rule (“the formation of coherent political communities, reliable state institutions and therefore living-spaces where individuals and their families could flourish”) is so obviously and irrefutably racist that it must be shut down. …criticism requires an objection supported by reasons, but these tweets didn’t rise above the level of spitting hatred. No, my complaint was about the uncivil manner. I held that this was an inappropriate way for one academic colleague to express disagreement with another and, more important, that it was an appalling example to set students. 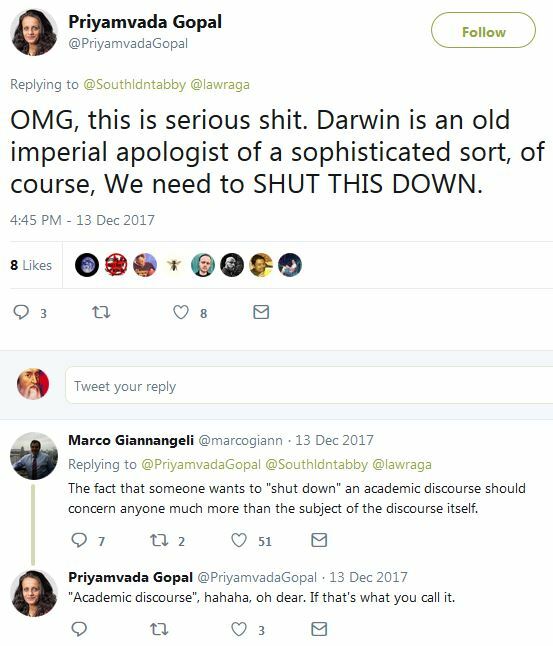 I could have added that, if a university teacher is seen to treat an academic peer with such hissing contempt, then intimidated students are likely to be discouraged from speaking their dissenting minds. So what did the two heads plan to do about it? The problem with this is that we can’t live by law alone. For if we tried, civil society would not long remain civil, and civil peace would not survive at all. That’s because all sorts of wrong can be done legally. Within limits, it’s no crime to be grossly unkind, unfair, mendacious, contemptuous or vindictive. That doesn’t mean it’s morally OK. It just means that the police and the courts don’t have the power to counter every form of injustice — or that, if they did have the power, the state would be dangerously intrusive. So if one person abuses his legal freedom to spray others with provocative vitriol, and if they then react by availing themselves of the same liberty, what will happen? Sooner than later, war. So if we haven’t learnt to restrain ourselves so as to be capable of doing justice in one place, then the chances are that we’ll show ourselves incapable of it in others. Those who hurl abuse on Twitter are likely to inflict abuse in other contexts. Those who are rude, terse or gratuitously offensive in a blog chat thread are likely to debase and cause injury to others in darker corners. Those who send bullying and intimidating private emails are likely to be bullies in other places. Jesus put it rather well: ‘He that is faithful in that which is least is faithful also in much: and he that is unjust in the least is unjust also in much‘ (Lk 16:10). Professor Nigel Biggar is a distinguished academic who is preeminently concerned with matters of faithfulness and justice. You may demur, but civility demands reason, and academic reason demands mental effort. Far easier to shriek ‘SHUT THIS DOWN’, just like the mob once shouted ‘CRUCIFY HIM’.